Torvegade (lit. "Market Street") is the central thorughfare of Christianshavn in Copenhagen, Denmark, linking the city centre by way of Knippel Vridge with Amagerside Copenhagen at Christmas Møllers Plads. The street crosses Christianshavn Canal at Christianshavns Torv, the central square of the neighbourhood. The last section of the street runs on the embankment that across Stadsgraven. Torvegade was the central main street of Johan Sems's original town plan. Amager Gate was built in 1624 at the eastern end of the street, although the bridge which connected it to Amager across the Stadsgraven moat was not completed until 1628. The Amager farmers passed through the street on the way to town with their produce. Amager Gate was demolished when it was decided to decommission Copenhagen's fortifications in the 1850s. In the 1920s, the City decided to build a new Knippelsbro Bridge to widen Torvegade. Until then, the portion between Knippelsbro and the canal had been known as Lille Torvegade ("Little Market Street") while the portion between the canal and Christianshavn Rampart was known as Store Torvegade ("Great Market Street"). The houses along its north side (uneven numbers) were all expropriated and demolished. The expanded Torvegade was ready in 1926. The Acciseboden ("TheOctroi House) at Christianshavn Rampart was originally a residence for the guard at Amager Gate. It was located just inside the gate but moved 12 metres in connection with the expansion of Torvegade in 1926. It was from 1857 to 1916 used by the soldiers who patrolled Christianshavn Rampart. The Acciseboden is thus misleading since it was never directly involved in the collection of octroi. No. 22, 24, 27 and 30 all date from the 18th century and are listed. The Rhode House, on the corner of Strandgade, is from 1640. The Olsen-banden gang drives through Torvegade at 0:58:54 in The Last Exploits of the Olsen Gang (1974). ^ "Befæstningsleksikon 1600-1870" (in Danish). Selskabet for Københavns Historie. Archived from the original on 2011-07-19. Retrieved 2013-03-11. ^ "Torvegade" (in Danish). indenforvoldene.dk. Retrieved 2010-01-04. ^ "Torvegade 75" (PDF) (in Danish). Christianshavns Lokalhistoriske Arkiv. Retrieved 2013-03-13. ^ "Strandgade 14-14a". indenforvoldene.dk. Retrieved 2013-03-11. ^ "Film 6 Olsen Bandens sidste bedrifter / Der (voraussichtlich) letzte Streich der Olsenbande". olsenbande-homepage.de (in German). Retrieved 5 October 2017. Wikimedia Commons has media related to Torvegade. Danish Architecture Centre, DAC, is a communication and development centre for architecture in Copenhagen, Denmark. It was founded in 1985 as a collaboration between the Danish Ministry of Culture, the Ministry of Economic and Business Affairs and the Realdania foundation. Danish Architecture Centre was founded in 1985 through a collaboration between the Danish Ministry of Culture, the Ministry of Economic and Business Affairs and the Realdania foundation. It moved into the Gammel Dok building after renovation and conversion work carried out by Erik Møllers Tegnestue had been completed in 1986. The plaza in front of it was out in 1997 following the completion of neighbouring Arkitekternes Hus. The project has been designed by Rem Koolhaas with the collaboration of dUCKS scéno for scenography, DHV for acoustics studies, by means of temporary exhibitions and events, it seeks to communicate knowledge of architecture and urban planning, promoting interest by the general public. The DAC develops projects and operates various programmes promoting cooperation across the boundaries of the construction. Christianshavns Torv is the central public square of the Christianshavn neighborhood in Copenhagen, Denmark. It is situated at the intersection of Torvegade and Christianshavn Canal, Christianshavns Torv traces its history back to Johan Semps 1617 plan for the layout of Christianshavn to be a fortified market town. It was originally known as Børnehustorv after Børnehuset, an orphanage which was established in 1622 on its east side. A blue-painted water post was installed in the square in 1633 and it was fed by a lead pipe which brought water all the way from Peblinge Lake on the other side of the harbour. The institution was converted into a prison. The old building was replaced by a new one designed in the Baroque style by Philip de Lange, a police station opened in the square in 1815. One of six new police stations, it covered the Christianshavn. It was based in Jacob Bastians Købmandsgård, at No,1, on the corner of the square and the canal. Langes building was demolished in the early 1860s to make way for a new building completed in 1864 to designs by Niels Sigfred Nebelong. From 1870 it was known as Christianshavns Straffeanstalt and served as a prison for women, in 1868, the vegetable market at Amagertorv, where the Amager Women had sold their produce for centuries, was moved to Christianshavns Torv. It only existed for two decades and was in 1889 replaced by a new vegetable market which opened at Vendersgade. The coming of the new century brought change to the square, the buildings surrounding it were pulled down in the 1890s and early 1900s and replaced with new ones. Christianshavn Penitentiary was demolished in 1928 in connection with a widening of Torvegade, the Greenland Monument was created by Svend Rathsack in bluish granite from Bornholm and installed in the square in 1938. It consists of a Greenlandic hunter with his kayak, placed high on a plinth above two groups of working women, one of Copenhagens old telephone kiosks of the original model which was designed by Fritz Koch and first installed in 1896. It is hexagonal with a roof over richly decorated wooden friezes. The Behagen House is a Neoclassical townhouse located on Strandgade in the Christianshavn neighbourhood of Copenhagen, Denmark. Two houses similar to the neighbouring Sigvart Grubbe House at No.28 were built at the site by Sigvart Grubbe in 1626, in 1759, Gysbert Behagen, a wealthy merchant, acquired one of the two houses. In 1764, he obtained a licence to establish a sugar refinery in the yard. In 1768, Behagen acquired the house and in 1669 he undertook a comprehensive renovation of his properties. Behagen lived there until his death in 1783, in 1791, the house was acquired by Jeppe Prætorius, another merchant. In 1796, it was subject to another renovation, notable residents include supreme court attorney and politician Orla Lehmann who lived there in 1847-48. He was one of the fathers of the Danish constitution of 1849, carl Joakim Brandt, a priest, church historian and literary historian, lived on the ground floor in 1876-79. The painter Frants Henningsen lived on the floor in 1890–94. The central triangular pediment above the floor features a cartouche with the letter B.
Stadsgraven is the canal which separates Christianshavn from the rest of Amager in Copenhagen, Denmark. It was originally a moat located in front of the Christianshavn Rampart as part of the citys Bastioned Ring Fortifications, Stadsgraven was created when Christianshavn was constructed in the shallow waters off Amager in the early 17th century. Apart from the main Stads canal, there is a parallel Inner Stadsgraven along its northern portion, Stadsgraven is connected to the main harbour both north and south of Christianshavn. There are four causeways and two footbridges across Stadsgraven, another dam is located at the southern mouth of the canal where it passes below Kalbebod Bastion, the southernmost of Christianshavn Ramparts 12 bastions. The last two dams are located at the end of the canal at Holmen. 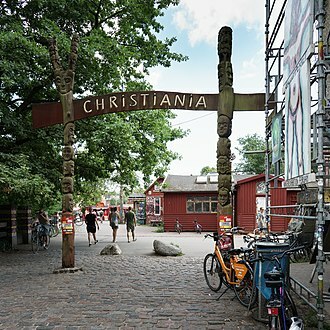 The two footbridges are located on each their side of Torvegade, the northern one, Dyssebroen, is located within the Freetown Christiania. The other one is a bridge located at The Panters Bastion, roughly opposite the Radisson Blu Scandinavia Hotel. Holmen is a water-bound neighbourhood in Copenhagen, occupying the former grounds of the Royal Naval Base and Dockyards. In spite of its name, deceptively in singular, Holmen is a congregation of small islands, forming a north-eastern extension of Christianshavn between Zealand and the northern tip of Amager. Since the early 1990s, the area has instead been redeveloped for use as a new district of the city. The area is characterized by a mixture of residential developments, creative businesses and educational institutions. Holmen is home to the Copenhagen Opera House which was completed in 2005, though technically a part of the central Indre By district of Copenhagen, being a cul-de-sac as districts go, the area has a somewhat quiet and remote reputation and feel to it. Frederiksholm is the area which has seen most new construction since Holmen naval base was closed, many new buildings have been built while old buildings from the areas naval past have been converted for new uses. 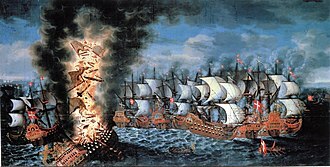 The existence of Holmen originates in a wish to relocate the Danish Fleet from its home at Bremerholm. Since the city was growing rapidly, it was no longer practical to have the fleet stationed in the center of the city, being built out of timber, the vessels constituted a major hazard. Furthermore, the sailors disposed of their garbage by throwing it directly into the harbor, in 1680, a plan was conceived to move the fleet out of the city. Responsibility for the plan was given to Admiral Niels Juel, from 1682-92 Christianshavns Vold was extended northwards to protect the area which had been chosen for the fleet. The extension had seven bastions, named for members of the Royal Family, in Carls and Wilhems Bastion, black powder depots were constructed. Built in 1688 and 1690, they are the oldest structures at Holmen, the northernmost bastion was Charlotte Amalies Bastion, and north of this two cannon batteries were established, Batteriet Quintus and Batteriet Neptunus. The latters name came from the ship which was the foundation for the battery. This battery was renamed to Christiani Sixti Batteri, or Christian VIs Battery. Christianshavn is a neighbourhood in Copenhagen, Denmark. Part of the Indre By District, it is located on artificial islands between the islands of Zealand and Amager and separated from the rest of the city centre by the Inner Harbour. It was founded in the early 17th century by Christian IV as part of his extension of the fortifications of Copenhagen, originally, it was laid out as an independent privileged merchants town with inspiration from Dutch cities but it was soon incorporated into Copenhagen proper. Dominated by canals, it is the part of Copenhagen with the most nautical atmosphere, students, artists and traditional families with children live side-by-side. Administratively, Christianshavn has been part of Indre By since 2007, Christianshavn covers an area of 3.43 km², and includes three minor islands to the north, jointly referred to as Holmen. It has a population of 10,140 and a density of 2,960 per km². To the south and east Christianshavn is defined by its old ramparts, to the west Christianshavn borders on the Inner Harbour that separates it from Slotsholmen and the rest of Copenhagens city centre. In 1612, Christian IV initiated a programme to fortify Copenhagen. During the period 1618-1623, he erected earthen embarkments with five bastions in the area between Copenhagen and the island of Amager. At the same time the idea was hatched of creating a new merchant town in the area, in 1639 the little merchant and fortress town of Christianshavn was established. 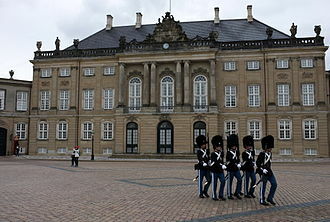 However, competition from Copenhagen soon proved too strong for the little town, the fortifications were further developed with six more bastions in the 1660s, and seven more bastions between 1682-1692. Additional reinforcements occurred between 1779–1791, and again in 1810-1813, even though the fortifications around the Inner City were being dismantled in the late 19th century, Christianshavns fortifications continued in use into the 20th century. Some areas were opened up in the late 1910s-1920s, and the areas were made public space in 1961. The fortifications are a part of the fortification system around the old part of Copenhagen. 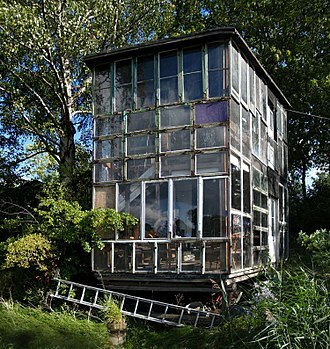 Glass house in Freetown Christiania, one of the many idiosyncratic constructions exemplifying modern "architecture without architects". Windmills at Refshaleøen. Øresund Bridge in background. Left to right: Kjeld, Benny, Yvonne, Egon. Olsen Gang silhouettes at a cinema wall in Thisted, Denmark. DVD Cover of the first Norwegian Olsenbanden: from left to right: Benny, Egon, Kjell.